Our range of products include alloy steel flats. Nandishwar steel offers Mild Steel, Carbon Steel & Alloy Steel Flats. 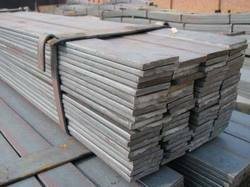 This steel contains various alloying elements like chromium, nickel, molybdenum, vanadium, manganese, silicon, boron etc. depending upon the end usage. Addition of alloys helps in improving mechanical properties such as impact, hardness, tensile strength, yield stress etc. Our steel has diverse applications in manufacture of components for Hand tools like pliers and spanners etc. Avail from us a gamut of stainless steel flats that are appreciated for superior quality and excellent durability. These flats are made from high grade stainless steel tested on various quality parameters. The flats offered by us is in stainless steel finish in different grades including TP-201, 202, 304, 304L, 316, 316L, 321, 309, 309S, 310, 409, 410, 410S, 420, 430. Some of the other specification include IS 2062, L/C, EN8, EN9, EN15, EN45A, Class II, Class IV, 16MnCr5, 20MnCr5, ST52 and other carbon & alloy steel grades. The narrow band of Jominy hardness, strict chemical composition, close dimensional tolerance, freedom from surface defects are some of the special features of our Mild Steel, Carbon Steel & Alloy Steel Flats.